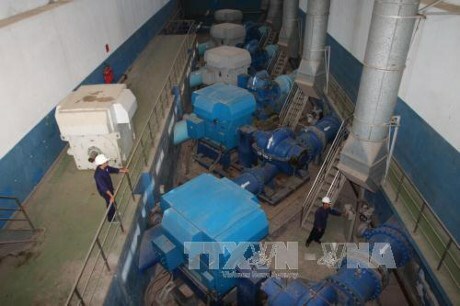 HCM City (VNA) – A water supply development programme, including 11 projects invested by Saigon Water Corporation (Sawaco), will be implemented in HCM City to supply clean water for all households. An agreement on the programe was signed by the Ho Chi Minh Financial Investment Company (HFIC), the Joint Stock Commercial Bank for Foreign Trade of Vietnam (Vietcombank) and Sawaco on August 9. Per the deal, HFIC and Vietcombank will provide a credit of 3.65 trillion VND (160.6 million USD) for Sawaco to implement the projects. Since 2015, HFIC and Sawaco have together carried out 33 investment projects to build water reservoirs and pipe networks in numerous districts, worth up to 3.3 trillion VND (145.2 million USD), with 2.24 trillion VND (107.36 million USD) sourced from HFIC. They include the water supply networks on Belt Road 2, Huynh Tan Phat and Nguyen Dinh Chieu streets, the reservoirs of Tan Hiep Water Treatment Plant and Thu Duc Water Treatment Plant. According to the agreement, Vietcombank will continue providing water fee collection services for Sawaco’s units. Tran Vinh Tuyen, Vice Chairman of the municipal People’s Committee lauded the cooperation among the stakeholders, saying it is crucial to have such connections to mobilise resources for infrastructure projects.